We’d love your help. Let us know what’s wrong with this preview of Awaken Your Third Eye by Susan Shumsky. To ask other readers questions about Awaken Your Third Eye, please sign up. I found the initial chapters of this book somewhat challenging with all the scientific and ”technical” information it provides. Susan Shumsky is an extremely erudite author, and always expatiates on all aspects of the subject she is dealing with. We are informed that fluoride can calcify the pineal gland, but that certain foods can aid in its decalcification, e.g. garlic, lemons, apple cider vinegar, hemp seeds, nigella sativa, seaweed, etc, etc. Obviously, we should avoid toothpaste containing f I found the initial chapters of this book somewhat challenging with all the scientific and ”technical” information it provides. Susan Shumsky is an extremely erudite author, and always expatiates on all aspects of the subject she is dealing with. We are informed that fluoride can calcify the pineal gland, but that certain foods can aid in its decalcification, e.g. garlic, lemons, apple cider vinegar, hemp seeds, nigella sativa, seaweed, etc, etc. Obviously, we should avoid toothpaste containing fluoride. There is a chapter about developing one´s super-senses. This was easier. We are given a meditation in which we simply ask Spirit to help us open our third eye. This is very helpful. The material corresponds to that in Susan´s book “How to hear the voice of God”. In another wonderful chapter we are informed about the Siddhis, the supernormal powers described in “Yoga Sutras”. Again we are instructed how to ask for these, one at a time. I was delighted with this chapter, though I have more basic things to ask for than the Siddhis! Subsequently, there is another difficult chapter about Third Eye Alchemy, more precisely, the “dantians”, which are “vital centres for energy cultivation, diagnosis, and healing”, and a chapter about nectar, or soma, in our third eye. Susan states that the chemical DMT, produced by the pineal, might be a generator of spiritual or mystical experiences. One of the best chapters, for me, was the one entitled “Third Eye Affirmations”. We are provided with excellent affirmations like those in my favourite book of Susan´s called “Miracle Prayer”, an indispensable book. I AM the light of God. The light of God permeates me and floods me with peace. The light of God infuses my being with radiance. The light of God lifts me with its power and glory. Which vibrates within me and all around me. While speaking this affirmation, we should imagine God´s light filling and surrounding us with divine power and glory. We are gifted with various affirmations, including a third eye invocation and a “treatment” for opening your third eye. In the next chapter we get instructions for doing Susan´s breakthrough session, as given in some of her other books. But I find the chapter in this book to be more specific. Susan tells us that the Divine Revelation Meditation practice is a powerful way to open your third eye and develop clairvoyant, clairaudient, and clairsentient abilities. In one of the final chapters, we are provided with accounts of the exciting third eye experiences of some of Susan´s clients or readers. To sum up, I would strongly recommend this immaculately written and erudite work, which suggests multifarious ways of opening the third way, so there are at last a few that everyone can do! Good luck! 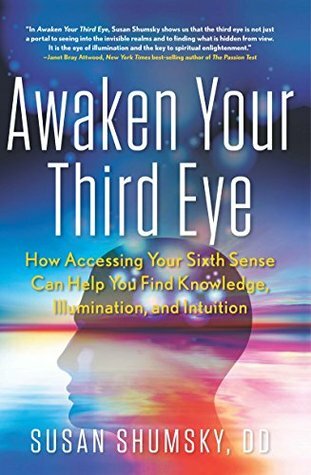 Awaken Your Third Eye by Susan Shumsky, D.D., explains how to open your third eye—known to some as the sixth sense—through provided exercises, breathing and yoga, and meditation. The book opens with an intro and a quiz, then goes into the history of the third eye, The Great Seal (the eye symbol on American money), and Egyptian backgrounds. There is much scientific information provided as well, including an explanation of melatonin and the pineal gland, which should interest readers who lean toward scientific explanations of seeing with the third eye. The book also explains how by “letting go” you can receive messages and connect with higher powers through anything from voices, sounds, smells, or even tastes. There are personal accounts, philosophical sayings, guidance on letting in the right spirits or beings, and related stories on the practice. Overall, the book covers all bases on the topic of seeing with the third eye or extra-sensory perception. I had a few personal favorite methods, including the “do nothing” method, which is where I believe I’ve stumbled in the past with attempting third-eye knowledge. Basically, it’s not easy to just ask and wait for an answer from a spirit or guide, but author Susan Shumsky, D.D. helps sort out areas where the normal person might have problems with their attempts at connection. The meditations, in particular, were useful to me, and I did try them with success. The Third Eye Meditation was my favorite, and I did in fact see much through this practice. Also interesting was the Golden Ball exercise, and while I’ve done yoga in the past, the yoga poses and breathing instructions were quite useful overall. I would recommend Awaken Your Third Eye to anyone with an interest in awakening their sixth sense through various exercises and meditations or anyone who likes learning about yoga, chakras, or the scientific and historical background of these studies. Dr. Susan Shumsky has dedicated her life to helping people take command of their lives in highly effective, powerful, positive ways. She is the best-selling author of 14 books, published by Simon & Schuster, Random House, and New Page. A pioneer in the human potential field, she has spent 50 years teaching thousands of people meditation, prayer, affirmation, and intuition. Her book titles incl Dr. Susan Shumsky has dedicated her life to helping people take command of their lives in highly effective, powerful, positive ways. She is the best-selling author of 14 books, published by Simon & Schuster, Random House, and New Page. A pioneer in the human potential field, she has spent 50 years teaching thousands of people meditation, prayer, affirmation, and intuition. Her book titles include Miracle Prayer, Divine Revelation, Exploring Meditation, Exploring Auras, Exploring Chakras, How to Hear the Voice of God, Ascension, Instant Healing, The Power of Auras, The Power of Chakras, Awaken Your Third Eye, Awaken Your Divine Intuition, Color Your Chakras, and Maharishi & Me. Dr. Shumsky is a highly respected spiritual teacher, award-winning author, and founder of Divine Revelation®—a unique field-proven technology for contacting the divine presence, hearing and testing the inner voice, and receiving clear divine guidance. For 22 years, her mentor was Maharishi Mahesh Yogi, who was guru of the Beatles and guru of Deepak Chopra. Dr. Shumsky served on Maharishi's personal staff for 6 years. A sought-after media guest and highly acclaimed professional speaker, Dr. Shumsky has done over 600 speaking engagements and over 900 media appearances since her first book was published, including Woman's World, GQ, Cosmopolitan, Los Angeles Times, Washington Post, nationally syndicated TV and radio, Alan Colmes on FOX news, Coast to Coast AM with George Noory, and William Shatner's TV show. She is featured in the movie Three Magic Words. Her websites are www.drsusan.org and www.divinetravels.com.